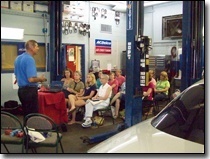 Waterloo Automotive strives to be a good neighbor, responsible to all residents and workers in our areas of business. We give back to the community by participating in a number of charitable and philanthropic efforts. 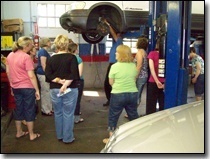 Our work extends beyond auto repair and into the community. Thank you for your overwhelming support of our two charities during our Guest Appreciation Week. Thanks to your support, we were able to donate over $1000.00 to the Waterloo Tree of Lights campaign helping local needy residents and over $1500 to the Jenny Straszacker Memorial Scholarship Fund assisting the students of St. Margaret Mary Alacoque attend high school. We couldn’t have done it without your help. 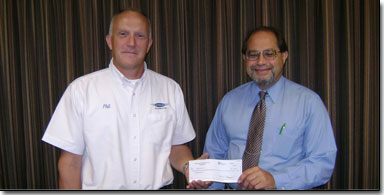 During the month of August, we donated $5 from every oil change to the Muscular Dystrophy Association. We raised an amazing $990 thanks to the 198 guests who stopped in to support the cause. 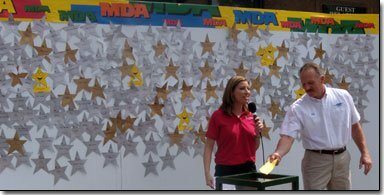 Our owner, Phil Meyer, presented a check to the MDA at the annual telethon on Monday, September 7. Thank you for helping us make a difference. Congrats to Gabrielle, Kayla, Maddy, Brianna, Hillary, Heather, Jeremy, Ryan, Jared, Kelsey, Ben, Sawyer, Caden, Bridget, Joel and Micaela, the winners of the first annual Waterloo Automotive art contests! They all received prizes, and their art will be on display in our lobbies for the next year. Thanks to all the students, teachers and parents for making the contest such a success. Waterloo Automotive is proud to work with the Mississippi Valley Regional Blood Center by holding blood drives throughout the year. 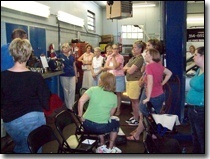 Our first blood drive in February 2009 was a huge success. We were thrilled to see so many of our customers stop by, and we were glad we got to show a small measure of our thanks by handing out prizes and holding a drawing for a Garmin GPS. Watch our site to see when the next blood drive will take place. Waterloo Automotive takes part in the Red Cross efforts to support our wounded service members. Each year, we work together with our customers to send holiday cards to recovering military personnel. We hope to participate in other Red Cross events to show our deep gratitude to our troops.